Sanam Akhavan joined Wilfrid Laurier University in September 2016 as an assistant professor in marketing. She received her BSc and MSc in Marketing Management from the University of Tehran, Iran on 2007 and 2009, followed by a Ph.D. from HEC Montreal, Canada in Business Administration with specialization in marketing in June 2016. 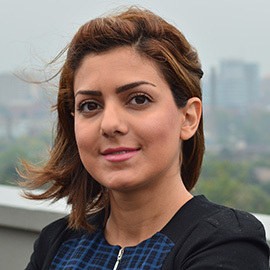 Prior joining Laurier, Akhavan was a researcher and lecturer for RBC Chair of E-commerce at HEC Montreal where she successfully developed a conceptual model for consumer empowerment and designed a novel scale for consumer power. The results of her studies have been published and presented in internationally recognized conferences such as Association of Marketing Theory and Practice and Global Branding Conference. Akhavan is a regular reviewer of AMA and ASAC. She has several years of industrial and entrepreneurial experiences in Iran, UK, and Canada. The main focus of her research is consumer behaviour, consumer power, and empowerment and brand management. Akhavannasab S., Dantas D.C., Senecal S., "Consumer Empowerment: The Framework”, Presented and published in the proceeding, Association of Marketing Theory and Practice, March 2014, Hilton Head, SC. Akhavannasab S., “Hierarchical Relationship among brand values in Customer mindset”. Presented and published in the proceeding, The 9th Global Branding Conference, April 2014, Hatfield, UK. Akhavannasab S., “Factors influencing the perceptual gap between customer and service provider in customer service quality evaluation”, Published in the proceeding, Academy of International Business- the Middle East and North Africa Chapter (AIB- MENA), 2010, Dubai, UAE. Akhavannasab S., Dantas D.C., Senecal S., “Envisioning Consumer Empowerment Process: A Micro Perspective”. Submitted to AMS Review: Second Revision.